The count of unfilled jobs in the overall construction sector increased in November, as hiring in the home building sector accelerated. According to the BLS Job Openings and Labor Turnover Survey (JOLTS) and NAHB analysis, the number of open construction sector jobs (on a seasonally adjusted basis) increased to 135,000 in November from 121,000 in October. The cycle high of 168,000 open positions was set during March. On a three-month moving average basis, the open position rate (job openings as a percent of total employment) for the construction sector held steady at 1.9% for November. 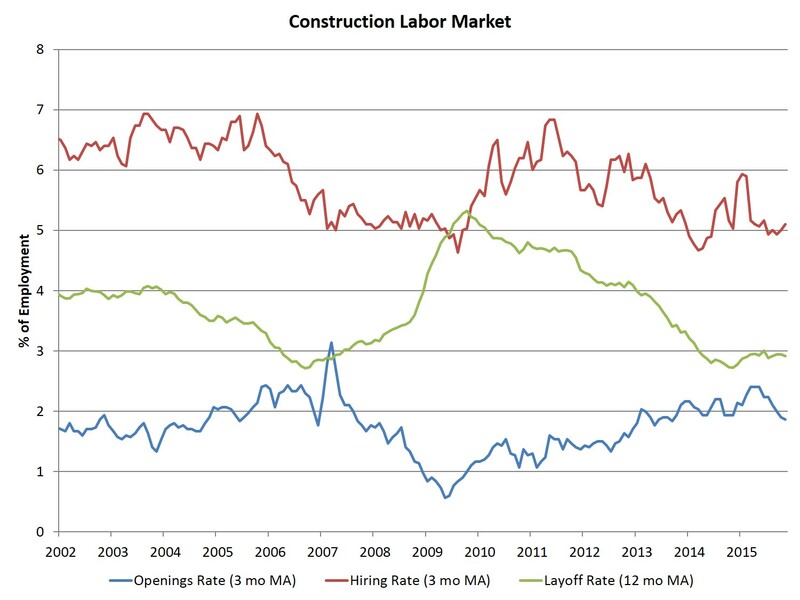 The overall trend for construction open jobs has been increasing, although the current open rate is down from the cycle high last reached in May (2.4%) as construction hiring picked up in recent months. The construction sector hiring rate, as measured on a three-month moving average basis, increased to 5.1%, although it remains near rates set in the spring of 2015. The quits rate for construction jumped to 2% for November, the highest rate since December 2014. Monthly employment data for December 2015 (the employment count data from the BLS establishment survey are published one month ahead of the JOLTS data) indicate that home builders and remodelers increased hiring significantly on a seasonally adjusted basis for the last two months. Total residential construction employment grew by 23,100 for December, after a pickup of 31,500 for November. The November gain was the largest single increase during the post-recession period. The pace of hiring for the residential construction industry had been slowing over the course of 2015. With the jumps in November and December however, the six-month average of monthly employment growth is now a healthy 15,000. 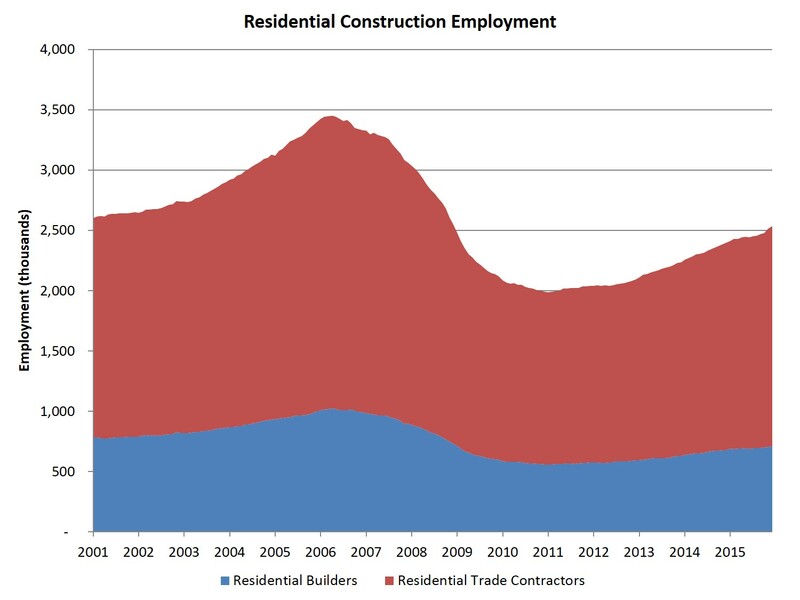 Residential construction employment now stands at 2.534 million, broken down as 710,000 builders and 1.82 million residential specialty trade contractors. Over the last 12 months home builders and remodelers have added 137,000 jobs on a net basis. Since the low point of industry employment following the Great Recession, residential construction has gained 547,700 positions. In December, the unemployment rate for construction workers increased slightly to 7% on a seasonally adjusted basis, up from the cycle low of 6.5% set during July. The unemployment rate for the construction occupation has been on a general decline since reaching a peak rate of 22% in February 2010. Many builders continue to cite access to labor as a top business challenge as the market recovers (for example, see this NAHB survey on the issue, focusing on builder and subcontractor workers). For the economy as a whole, the November JOLTS data indicate that the hiring rate held steady at 3.6% of total employment. The overall open job rate increased to 3.7%, near the 3.8% cycle high set during July. Rising job openings for the overall economy are affecting many business sectors as the unemployment rate has fallen, with employers wanting new workers but holding greater numbers of unfilled positions. This could bode well for future hiring, but it might also signal that scarcity for labor is becoming a more general concern.